This is the L Page of our A to Z guide to plants -- how to care for them, landscaping with them, and cooking and healing with them. 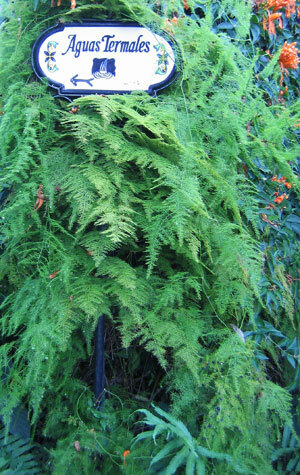 This is an extremely feathery long branched fern-like plant often used as greenery in delicate flower bouquets. It was never one of my favorite ferns, but at our former home in Montserrat it was a volcano survivor which gave it a lot of points in anyone's book! I found it especially hard to get it into a pleasing shape, but it can be done as you see in these photographs. 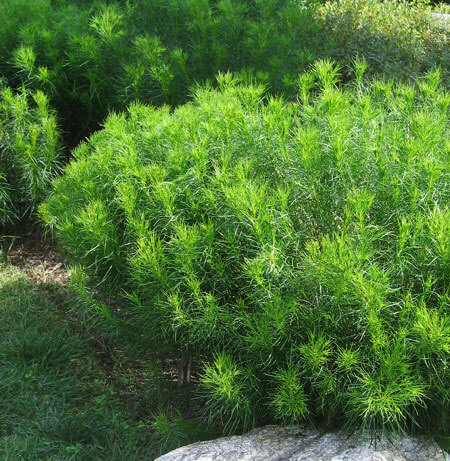 In the end, I have found out that it isn't a fern at all, but a perennial herb with fronds that may extend to more than 20 feet in length. Benefits: This is a plant with a variety of curative benefits. Photographed: On the left at the Botanical Garden in Naples, Italy, and on the right at the Hotel Regis in Panajachel, Guatemala. 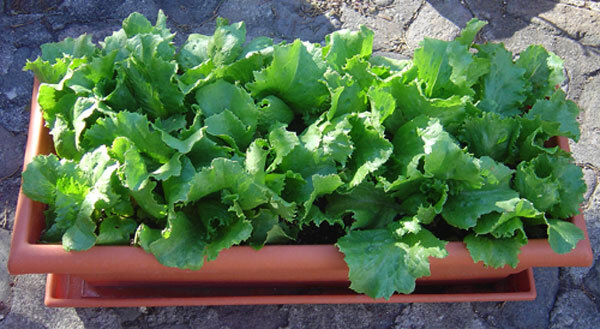 Planting and Care: These are extremely easy to grow plants. Plant them in a bright shady spot where whatever sun it gets comes in the morning. Water it when dry and lightly fertilize. I have seen them growing like these, with the support of a stump or light post or something similar and I think that is a very good way to see them at their very best. It is a plant with a tough grip on life. Not a spectacular flowering bush, but as a butterfly and hummingbird attractant lantana is terrific. Like so many other plants in a hot weather or tropical garden, the lantana is poisonous. The colors of its flowers range from pink lavender and white through to yellow and orange. Benefits: Lantana leaves may have anti-microbial, fungicidal and insecticidal properties. It has also been used in traditional medicine to treat a wide variety of illnesses. 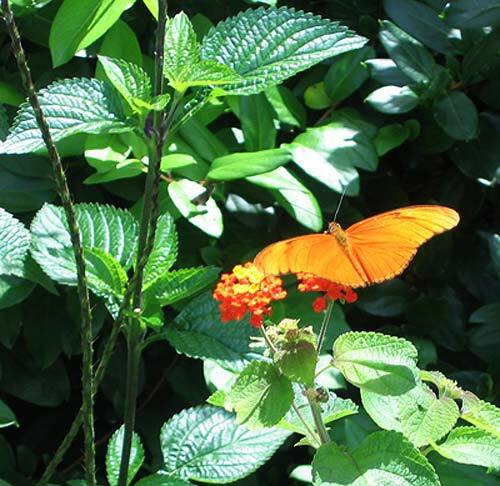 From: Lantana comes from the tropical Americas. 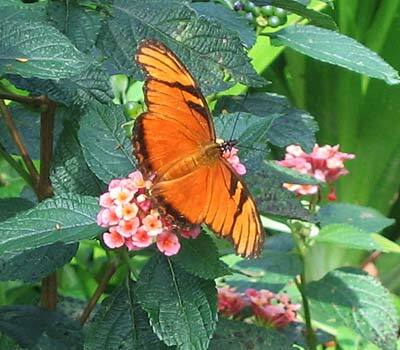 Planting and Growth: Lantanas are tropical and appreciate warmth as well as growing best in full sun. Once settled in lantana tolerates dry conditions and appreciates very occasional fertilizer. Drought can have a negative effect on lantana's overall health. This is a bushy plant growing to be about six feet tall. 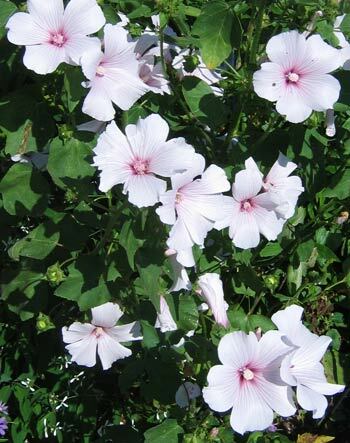 It can be a perennial, biannual, or annual depending on the variety you purchase. Benefits: It is said to have medicinal benefits when used externally as a poultice on sprains. Planting and Care: One of the odd qualities of this plant is its salt tolerance which makes it ideal for gardens near the sea. Give it full sun and routine watering or rainfall and it will do just fine. 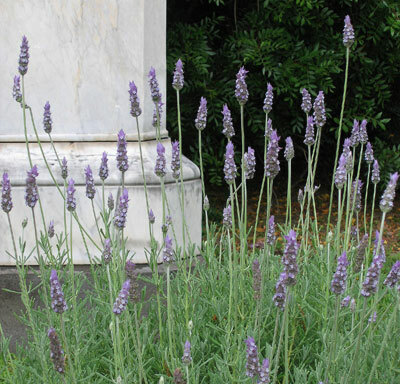 Lavender is one of those treasures that bloom all summer on about four foot tall stems. In warmer gentler climates it looks like that in Naples, Italy. In more robust climates like that in Patagonia where it also takes on a more robust appearance. Benefits: The leaves and flowers of lavender have long been used in herbal medicine, as a tea or essential oil. What surprises me is that lavender may also be used to repel moths as they do not find the scent as appealing as we do. From: The mountainous areas of western Mediterranean countries, especially northern Spain. Photographed: Below on the left in the Botanical Garden in Naples, Italy and on the right in Calafate, Patagonia, Argentina. 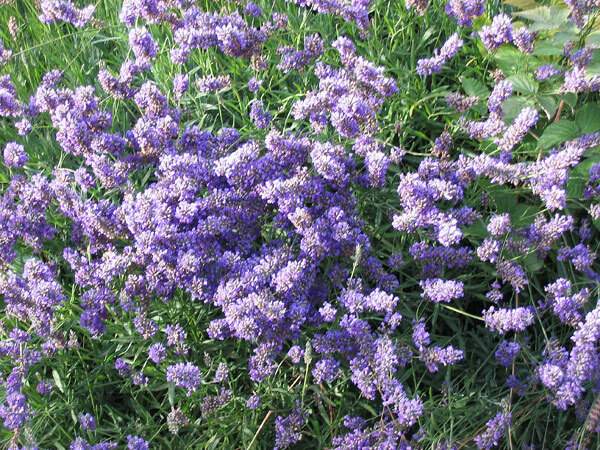 Planting and Care: Plant lavender in well drained relatively poor sweet or alkaline soil in a sunny place in the garden. It is also tolerant of relatively dry conditions which makes it even easier to grow. 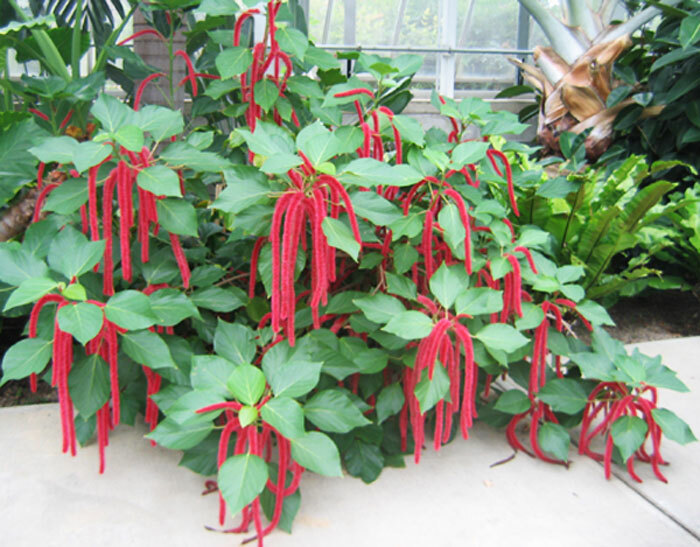 This very appealing plant has EXTREMELY long and piercing spines which makes it difficult to transplant so try to pick the idea spot for it right away so you never have to move it. Benefits: Research is underway to explore its potential in treating certain cancers. Photographed: Growing in a pot by our front door and later while flowering after being planted in the deck garden at our former home in Montserrat. Planting and growth: This is a warm weather cactus which grew beautifully in the Caribbean in a very sunny spot by the entrance and then in the garden in an area that received morning sun. I found it pretty adaptable, but it did seem to require a hefty amount of fertilizer to be at its best. It also likes more water than most other cactus. 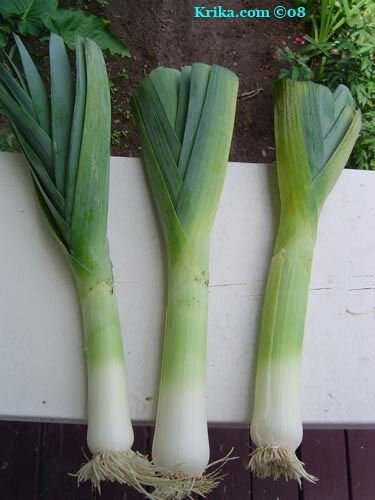 Being Irish I could easily sing the benefits of leeks if someone were willing to listen. Instead just make a pot of leek and potato soup and you'll know why I would sing. Benefits: Including leeks in your diet will give you a nutritional boost pretty much across the health spectrum. Not only do they aid in preventing illness, they provide additive benefits to the function of your body. From: The wild leek seems to be native to the world at large as it grew in its wild state in Britain and Europe through to Asia. It grew as well in Mexico and in parts of Africa. Planting and Care: In garden planting, dig a trench about 8" deep and mix the soil with good compost and a bit of sand. Add back about 4 to 6" of that mixture back into the trench and plant your leek seedlings taking care to plant only the white part. As the season moves on and the leeks grow, add back the rest of the soil and cover it with some sort of mulch to keep the soil moist. 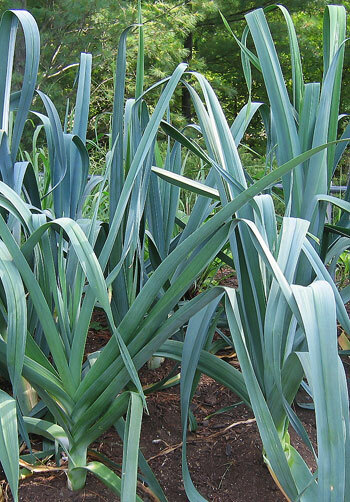 Leeks appreciate moisture, but do not do well in wet soil. Leeks also like soil that is high in nitrogen, so routinely give it compost tea during the growing season. Leeks can be harvested at any time, but usually gardeners wait until the stem diameter is about 1" or more. Photographed: At our former home in Montserrat. We were given a slip of this plant from a neighbor in Montserrat when it appeared as a weedy grayish green grass about twenty inches high. It grew well in our semi shady herb garden and quickly became a kitchen staple for flavorings and as a cooling tea. Benefits: Aside from being a regular ingredient in cooking anything that would be enhanced with a hint of lemon, it makes a lovely tea. It also may serve as a non-toxic mosquito repellant as its scent is the basis for Citronella. Lemongrass is also believed to be very good for your health preventing or alleviating many problems. 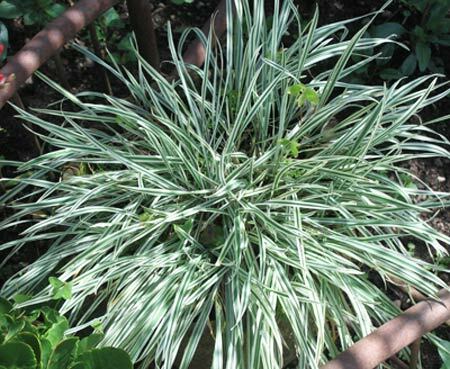 Planting and Growth: Lemongrass is a warm climate plant so in many places it will not over winter in the garden. In this case pot up some of the plant and bring it inside for the cold winter months. Keep it in a bright sunny window to be at its best. When danger of frost is over, replant it in the garden to be enjoyed all summer long. 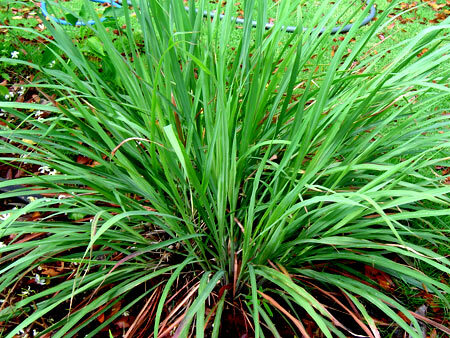 If you live in a warm climate, plant lemongrass in full sun and make sure it has regular rainfall or watering. It prefers a good composted soil with routine applications of compost tea to keep it at its best. All in all it is a very easy plant to have and enjoy. 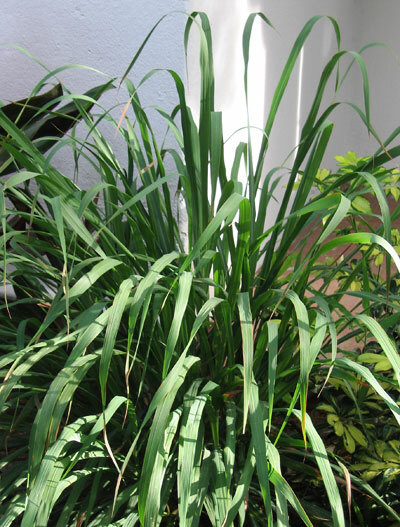 Click here to see the lovely lemongrass growing in our herb garden in Montserrat. Photographed: In our herb garden in Montserrat. Photographed: In our herb garden at Lake Atitlan in Guatemala, 2012. Lemons are truly wonderful. After living for many years in Mexico, I became appreciative and well adapted to the limes common there. They are much better than anything I knew as a lime in the States. Still, every now and then I would have loved to have a lemon. Benefits: Kidney stones are a common health complaint and they can be extremely painful. Solve the problem before it becomes one by routinely enjoying a glass of fresh squeezed lemon juice. Lemons contain high quantities of citrates that will likely break down calcium deposits that may eventually become kidney stones. Photographed: On the left below in the Botanical Garden in Naples Italy, and on the right in the Botanical Garden in Palermo, Italy. Planting and Care: Plant your small tree in well drained fertile soil in a sunny place in the garden which is protected from wind. 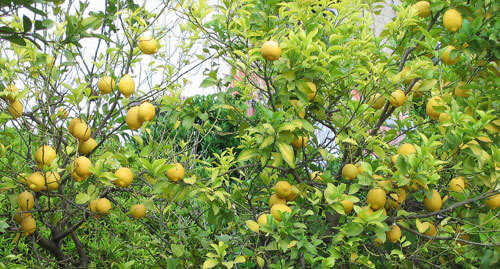 It is not difficult to grow a lemon tree from seed, but you may prefer to purchase one which will give you the type of lemon you want without waiting several years for the seed to mature enough to produce fruit. Still there is something to be said for starting a tree from seed. Take a few seeds from your preferred lemon. 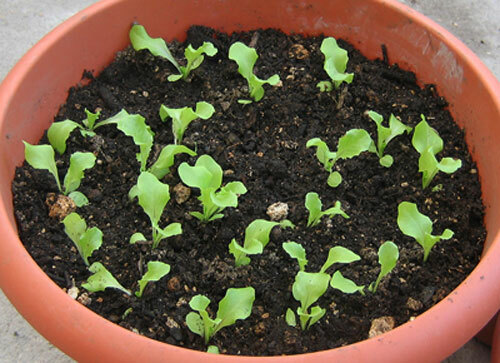 After soaking them in water overnight, place each seed in a 3 inch pot of fertile potting soil. Cover the seeds with about 1 inch of soil, cover them with plastic and put them in the sun. 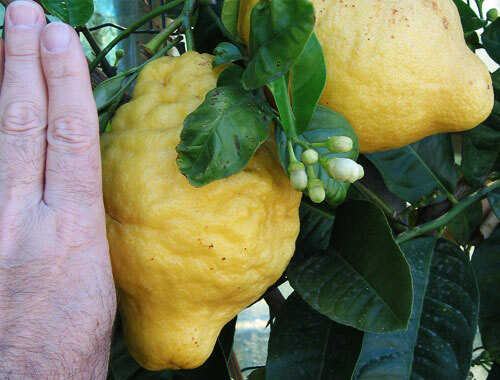 Check daily that the soil is moist until the lemon plant makes its appearance. Remove the plastic bag and move the pots to a place where they will be protected from the hottest afternoon sun and you'll be off and running. After several years you'll have lemonade! I ate my first lentils in Oaxaca, Mexico, in a Spanish dish made by my eventual husband. I fell in love with them as I had done with him. His recipe on the downside had a voluminous gas problem which made it better for singles. Benefits: Especially for women, iron is a very important nutrient and lentils are loaded with it. They also provide a hefty dose of B vitamins, zinc, fiber and protein. They may even help to reduce thinning hair. Aside from all of these body benefits, they are also easy to cook and absolutely delicious. Photographed: Planted, but never matured in my garden in the Guatemalan highlands. Before it matured, we left our home in Panajachel for a life on the road so there is no photograph of the lentils. Planting and Care: Lentils are in the pea family and prefer it cool. Depending on conditions, they will take two and a half months to more than three to mature. Growing to about two feet tall they will appreciate a support system, but will grow without one if more widely spaced. Lentils like to be planted in a place in the garden with full sun, routine rainfall or watering and a rich slightly acidic soil (6 to 6 1/2) enhanced if possible with compost. In the garden, lentils prefer to have potatoes and cucumbers nearby and onions and garlic as far away as possible. I remember having a plant similar to this when I lived in Rhode Island. Growing to about 2 feet in height, it provided a perfect bright green background for all of the flowers I planted. When it blooms, it has small very pretty purple flowers. Benefits: It is very attractive to butterflies. Planting and Care: Lettermann's Ironweed is a perennial wildflower which prefers to grow in full sun planted in any soil with good drainage. Handling life in the wild in these two states, this is a very hardy plant. 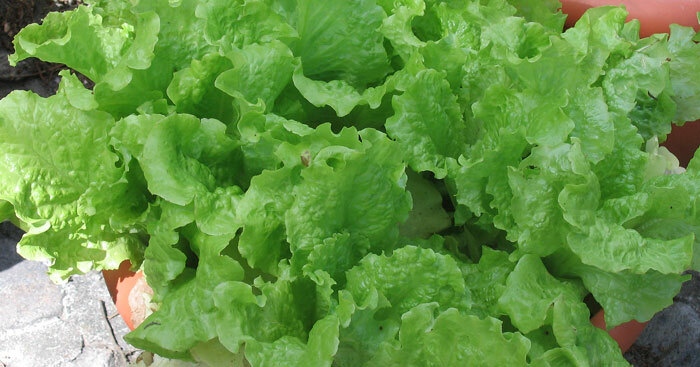 Benefits: The main benefit of lettuce is its wonderful fresh taste and its largely absent calorie count. You can eat pounds of it every day and gain not an ounce. Try having a salad with only freshly ground pepper and generous sprinklings of the best quality balsamic vinegar you can find. Look for one with no additives or buy organic if you can. For nutritional benefits go for the darker or more red leaved varieties. 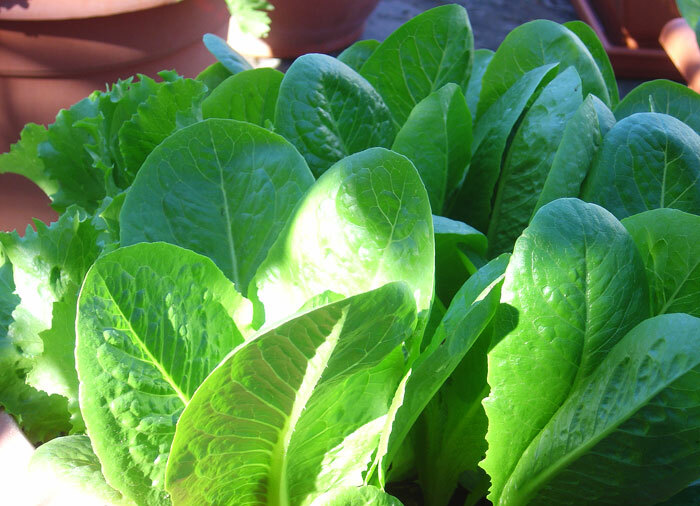 Lettuce is also said to be a high source of silica if that matters to you. 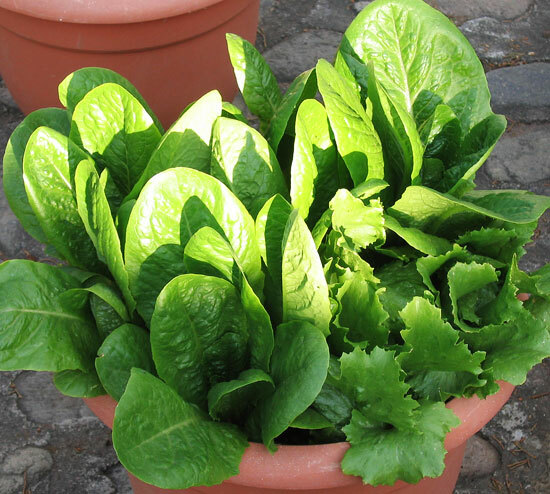 Planting and Care: Lettuce likes well drained soil with lots of organic matter, but it will do fine with less if it has adequate moisture and fertilizer. 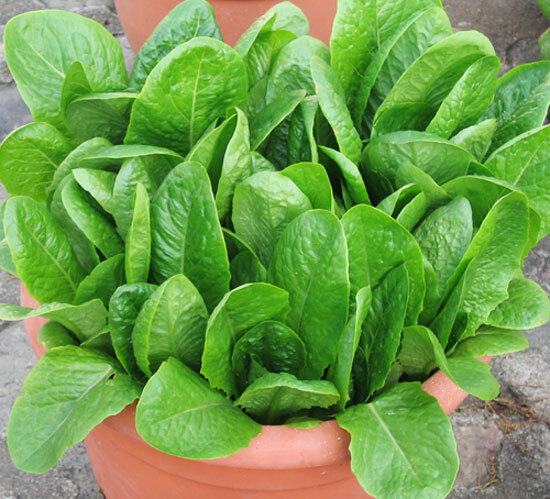 In Montserrat or in similar hot climates where the soil is marginal set out small lettuce in a well worked garden where they receive some shade from the hot mid day and afternoon sun. Until you have worked your soil well with compost, bathe them daily in good quality compost tea for the first two or three weeks. After that surround them with good quality compost mixed into the soil. You may also have to cheat and use a commercial fertilizer until you have been able to greatly improve the condition of your soil. Keep them well watered and you'll enjoy lots of salad. In Montserrat bugs were not a special problem with lettuce. Surprisingly, we had aphids, but they seemed to attack only our very young celery stalks and leaves. These we simply squished. 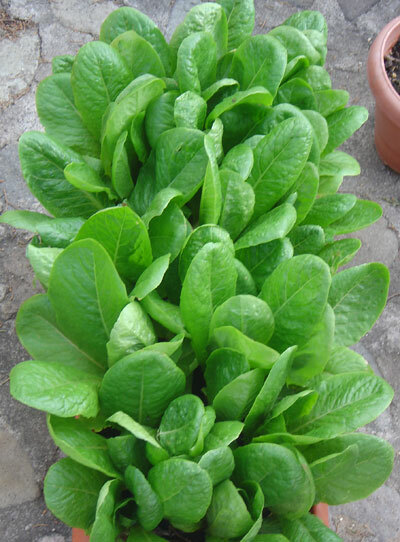 In the several years of growing lettuce there, our lettuce plants had no noticeable diseases or insect damage and never ever used any poisons. The British funded Department of Agriculture in Montserrat sold flats of a lettuce variety called Empire. It is relatively good when it works, but it takes a lot of care and bolts too readily to make it a viable commercially grown lettuce in a Caribbean environment. To no avail, we recommended that they try Lakeland a variety most typically grown in Tobago. 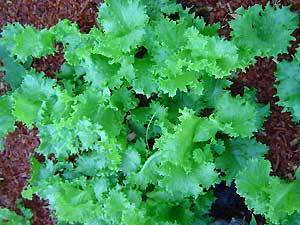 There the lettuce is wonderful; it has a great flavor, great texture and it survives the heat! 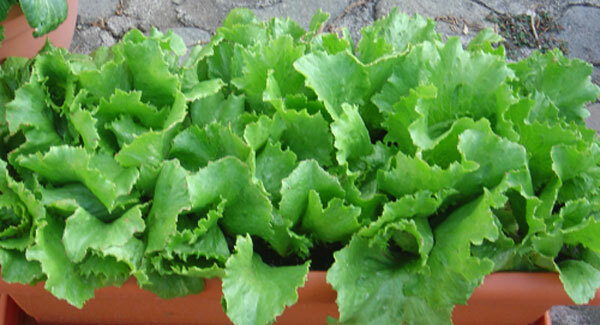 We even had friends send us seeds from Tobago for us to plant in Taxco, Mexico, because the lettuce was just so good! Sub-Tropical Highland Environments: Growing lettuce at Lake Atitlan in Guatemala is relatively easy. Plant the little ones where they will receive morning to noon sun and they will not bolt as quickly as they do in full sun. Fertilize them well when they are young to get them off to a good start and always keep them relatively moist. We have had great luck with a variety called "black seeded simpson." Another one that has done very well for us is "Grand Rapids." 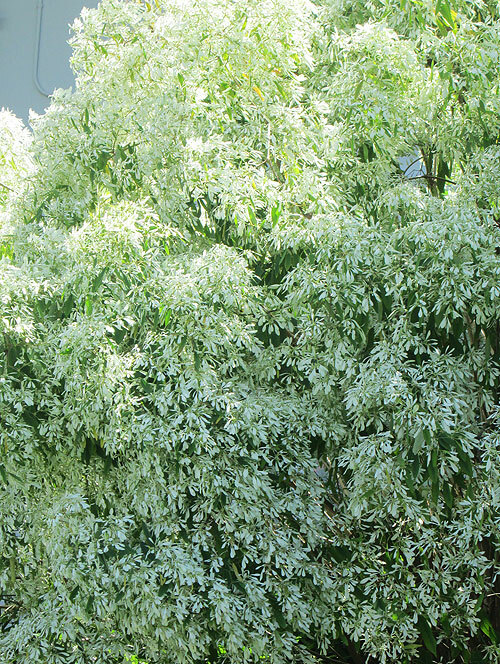 It grows quickly and despite its delicate appearance it holds up to punishing rains, heavy winds and very strong sun. Photographed: At our former home at Lake Atitlan in Guatemala. Photographed: In our Mahogany garden at our former home in Montserrat. Photographed: At our former home at Lake Atitlan in Guatemala, 2013. Photographed: At our former home at Lake Atitlan in Guatemala in 2013. Photographed: At our home at Lake Atitlan in Guatemala in 2015. Photographed: At our former home at Lake Atitlan in Guatemala in 2015. This is a relatively small tree growing to be at maturity only about thirty feet tall. Its real asset in the garden is that when it flowers it is spectacular! Plant it where its one inch blue flowers will maximize the show. It is a native of the Caribbean. Planting and Care: Like the cordia tree, the lignum is a true friend to tropical gardeners. 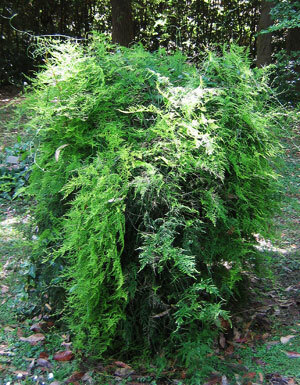 It loves the rain, but it will tolerate a long dry season, and it will grow happily in the sun or in a semi shady area. It does not grow too fast and will normally bloom in the spring. This is a spring flowering shrub that should be enshrined in the gardeners hall of fame. It probably already is in New England. I grew up with this plant and every spring dreamed of the coming abundant flowers with their heady scent. My best friend in all my life had lilacs for her wedding flowers and you can imagine the scheduling problems trying to aim for the most showy flowers of the spring season. I hadn't smelled them in many years when I spotted this one lone bush in Sicily. Slamming on the brakes I got out to take this photograph. Benefits: Lilac oil is said to have many medicinal benefits when applied to the skin. 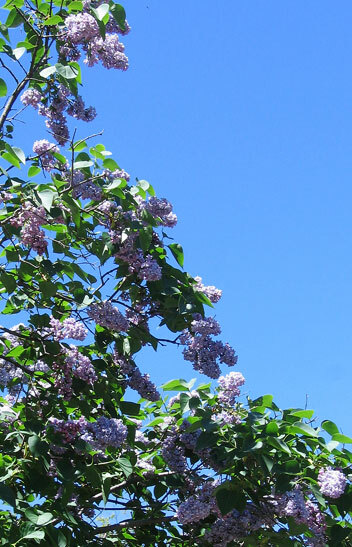 As an added benefit, lilacs are non-toxic to humans and to pets. From: The southern area between Greece and what we knew as Russia. Photographed: By the side of the road in Sicily, Italy, in 2012. Planting and Care: Lilacs are said to grow to be about 16 feet tall though I have never seen one this big. If you deadhead the flowers before they become seeds, you may have successive years of a real show stopper. Plant you lilacs in fertile, humus-rich, well-drained, neutral to alkaline soil. Make sure you have selected a site for it that will get no fewer than 6 hours of direct sun each day, more is preferable, and be sure it is in a place where there is good drainage. Planting a new lilac may be more successful if you do it in autumn rather than in spring. If I get to it I'll put up a picture of myself as a young child crowned with a wreath of lily of the valley flowers. I loved them and their scent and had no idea of their poisonous nature. Benefits: As with many poisonous plants, they are curatives as well as killers. Lily of the Valley is no exception having many uses in natural medicine. From: Woodsy temperate northern hemisphere. Planting and Care: In a northern garden with winter's snow and ice, this is a perfectly easy to care for ground cover preferring shade to sun making it especially prized. These little plants prefer alkaline sandy soils with generous amounts of humus and routine watering or rainfall in the summer months. Otherwise it is a darling of northern climate gardeners requiring not much at all. Warning: Lily of the Valley is a highly poisonous plant. The entire plant is toxic, but the leaves are especially so. The poison is convallatoxin which strengthens the hearts contractions, but it can as well slow down bringing on a coma and death with other unattractive symptoms along the way. Needless to say, don't eat it! Lily turf would be marvelous as a stone or brick walkway planting to brighten up a shady garden area. Even better it blooms with stalks of small mauve flowers. Best yet, it is an easy to grow perennial. Benefits: In traditional medicine the root of lily turf has many uses and benefits. Planting and Care: To me this is an especially attractive low growing plant, no more than about a foot tall, that would work well as a border planting in a semi-shady or sunny situation. Give lily turf a soil that is slightly acidic with added compost. Plant it in an area that receives some shade from hot afternoon summer sun and with routine rainfall or watering and it should do just fine. It will have a bloom time in August with very appealing purple flowers. My #12 Plant Mystery was solved by Glenn a visitor to my website who lives in Brisbane, Australia. Many Thanks. Photographed: At the Hotel Regis on Lake Atitlan in Guatemala in 2012. Calcium ground from limestone rock is normally used in agriculture to "sweeten" soil or make it less acidic. In olden days people actually tasted their soil to see if it were sweet or acid. Then they added to the soil what they believed necessary to correct the pH, either ground limestone or wood ashes. These days the most common way to sweeten soil is still to add agricultural lime or ground limestone There are two other types of lime. Burnt lime also known as quick lime can be used in the garden, but it is very active and burn you and your plants. Hydrated lime or slaked lime can also be used, but it is a dangerous material and contact with it should be avoided if at all possible. In Montserrat there was no available ground limestone or what is known as agricultural lime. And, the soil is extremely acidic due to the many layers of volcanic ash deposited over the last decade and to the once frequent acid rain falling when the Soufriere Volcano's sulfur dioxide emissions flowed north over the island where all residents lived. When we lived there, the Agriculture Department invested in many signs posted on the roadsides with such advisories as, "Eat from the land, not from the can." They highly recommend backyard gardens, but sadly they had none of the equipment to lend or agricultural materials to sell that would see their recommendations come to fruition in productive backyard gardens. When we lived there, you pretty much ate from a can or you went hungry. We developed a real fondness for the limes sold in Mexico which are smaller with a thinner rind than what we were used to in the States. 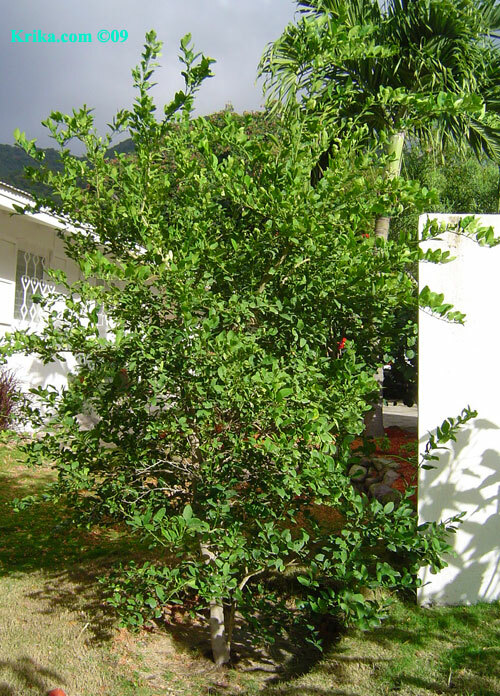 In the patio of our apartment in Taxco, Mexico, there was a twenty to thirty foot lime tree growing and I saved some of the seeds from that tree to bring to what was to be our new home in Montserrat in the West Indies. The flavor of these limes is not bitter like bigger limes can be and they are more tart than the bigger limes. Lime oil is extracted from the rind of these fruits and Montserrat was once famous for the exportation of lime oil produced from its many lime tree plantations. You are probably familiar with the brand, “Roses Lime” whose juice originated in Montserrat. More than a century ago, Montserrat lime juice was carried on British ships to prevent scurvy engendering the nickname “Limey,” but the island's orchards were severely damaged by disease in the 19th century and lime trees were never replanted for commercial purposes. Even today, lime trees in Montserrat are very subject to what is locally called “die back disease” which starts at the top of the tree and works its way down, eventually killing the tree. From: Originating in India and Malaysia, this lime is now found in warm climate countries around the world. Photographed: Just by our wall garden at our former home in Montserrat. Planting and Care: This relatively small tree prefers to grow in full sun and grown from seed will take from eight to ten years to bloom and produce fruit. We ate the first fruits from this tree just before we sold the property. I wish we could have taken it with us. In Montserrat, we were told by locals to water the lime tree with diluted urine to reduce the negative affects of ants on these wonderful trees. We heeded their advice and our Mexican lime was about twelve feet tall and very healthy when we left. Mix ½ cup of freshly squeezed lime juice, 1 cup of water, and 1 cup of sugar. Heat just until the sugar dissolves then cool and refrigerate. When cold, stir briskly and pour into small plastic cups with popsicle sticks. Freeze. 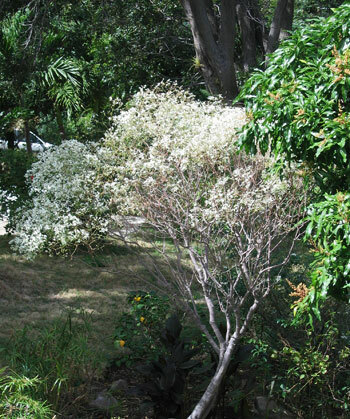 This is a very popular bush in various areas of the Caribbean as it has snowy white blooms just in time for Christmas. Benefits: I haven't found any yet other than its very pretty nature. Planting and Care: I'm probably risking disaster in saying this, but this plant seems to do well just about anywhere from shady to sunny and it is easily propagated with cuttings. If you have one of these plants take a look around the garden in the spring you will see lots of tiny Little Christmas Bushes sprouting here and there. They make lovely presents for friends and neighbors. If you should have to buy a plant, take a look at the size of the root ball as your hole should be about that deep. Dig the hole a bit deeper and wider all around and mix in some amendments to your natural soil. Plant the root ball and back fill so the soil is at the same depth all around. Stake it if you live in a windy area and give it a good watering. Be sure to follow any directions for your area that came with the plant and you should have no problems. These are easy to grow and should reach their 6 foot size in short order. Photographed: In our herb garden at our former home in Montserrat. Photographed: At the Latour Farm in Tobago in 2018. This is a very attractive low growing annual in colder climates as it prefers to live its life in warm places. Still, as you can see in the photographs, it is very appealing. Benefits: American Indians are said to have used lobelia as a medicine and it has been included as one of the basic medicinal plants in Chinese medicine. 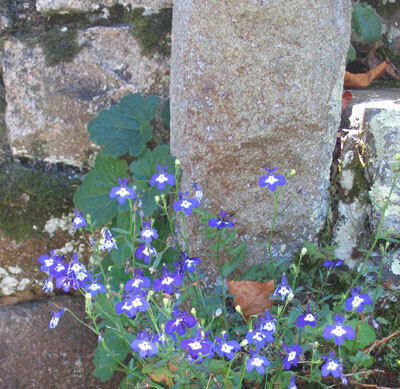 This lobelia was most often used in the treatment of lung disorders. It is also a plant that is tolerant of deer. 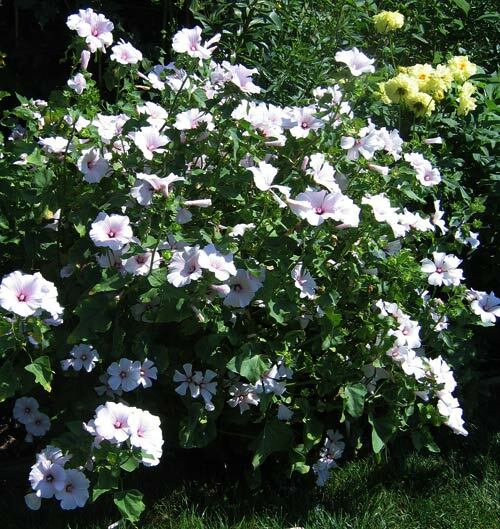 Planting and Care: These are pretty easy to grow plants as annuals. In northern places provide a space in the garden with lots of sun. In warmer places, try to place them where they will receive morning to noon sun, but bright light thereafter. They do like to be regularly watered or to receive regular rainfall. This lobelia is a hybrid, one of the more than 400 varieties in this large family. When mature it will be about 2.5 feet tall and covered with lovely pink flowers. You may also find it with lavender or red flowers. 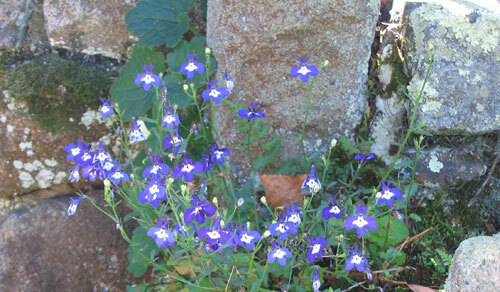 Benefits: This lobelia is tolerant of deer and of wet soil. Planting and Care: Caring for this lobelia is pretty easy. 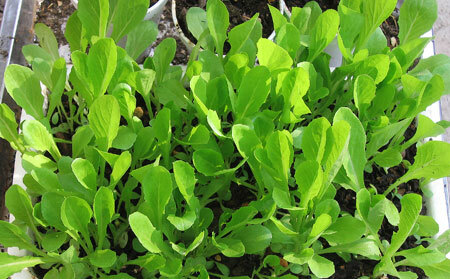 Plant it in a sunny or semi-sunny area of the garden. Give it plenty of water to keep it happy. In fact, this lobelia can be used in continuously wet areas of the garden which are usually difficult for successful plantings. Very common in Montserrat, the loblolly almost always has termites. 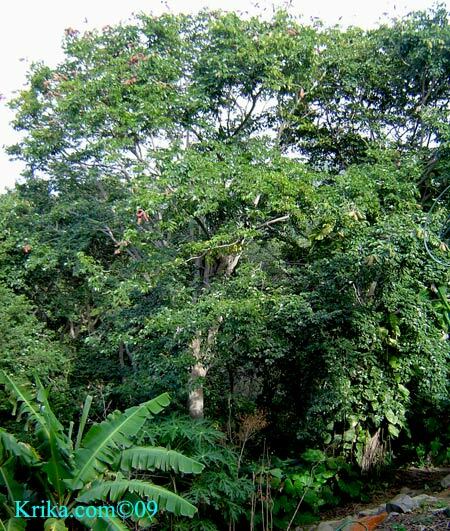 The locust tree is a staple in Montserrat and it was in our garden, especially in the area that bordered the national park. It is a stately tree with deep green shiny hard leaves. Our little agoutis (take a look at the "W" Page -- Wildlife) can be heard cracking the very hard seed pods that fall as this is their favorite food, but watch out yourself as one of these pods falling from thirty feet in the air can do some real damage to your head. The extremely hard large oval pods of this tree are smelly as the local name implies, but despite the smell some folks in Montserrat eat the powdery material inside. This is also a popular treat in nearby Antigua. The West Indian locust is is a handsome tree growing eventually to be about sixty-five feet tall with its deep green shiny leaves providing welcome shade in a tropical climate. We had several at varying ages. 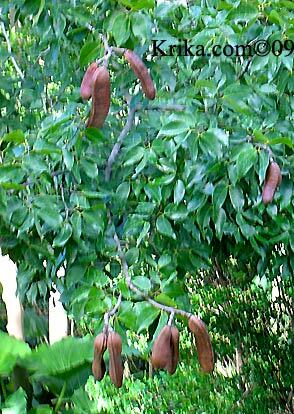 Benefits: The seed pods are great favorites of the largest local wild animal, the agouti. We can often hear them outside in the early morning gnawing on the hard shells of the pods. This tree also provides a very decorative medium brown wood with shades of red for making distinctive furniture. 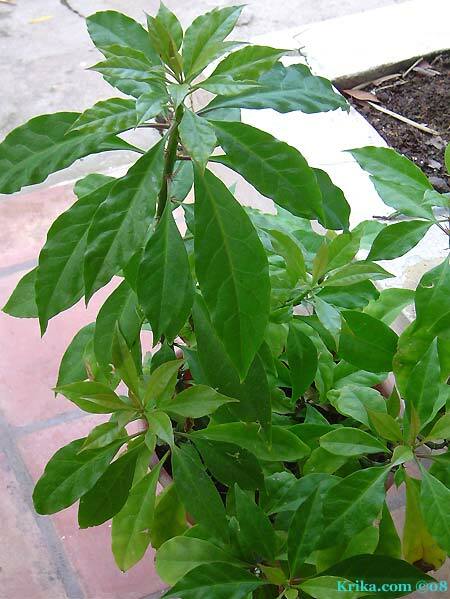 Parts of the tree have also been used to treat headaches and gout among other things. Photographed: In the banana garden at our former home in Montserrat. Planting and care: The locust appears to prefer very sunny locations with lots of moisture. In Montserrat, they usually bloom in June and July. By its very preference of location the locust puts itself at risk from termites who also seem to appreciate moisture. Little can be done about this except avoiding any damage to the bark or branches of your locusts. Do not trim branches unless absolutely necessary for the survival of the tree and be sure to treat cut surfaces with a protective covering. Check with your local agriculture department for their recommendations. This is the vine that produces the wonderful loofah bath scrubbers which, once used, no one can live without! Planting and Care: This vine likes full sun and lots of water. It covers whole yards and walls and produces its bounty in the three month summer rainy season in Mexico. It is not particularly attractive so put it where it will not be a centerpiece in your garden. I have to say I can't honestly distinguish between these two plants and even Wikipedia seems to be showing the same photographs for each of them. If you can help, I would greatly appreciate it. This is another of the tropical plants I find a little creepy. My husband loves it though and you may too. 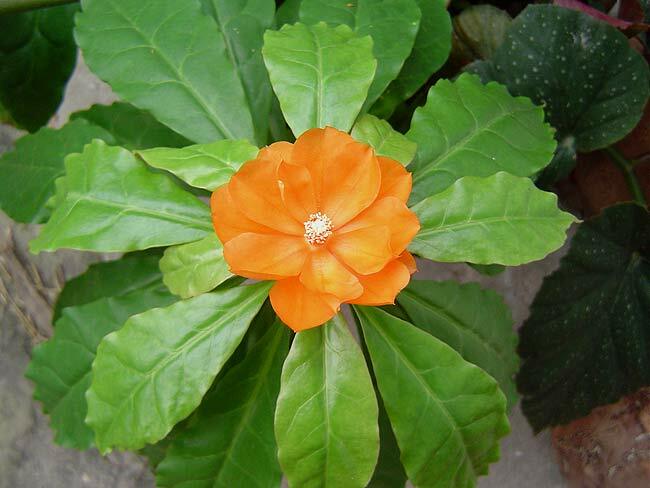 Benefits: The chenille plant has a wide range of medicinal applications both for internal and external problems. Photographed: In the Botanic Garden in Wellington, New Zealand, 2013. 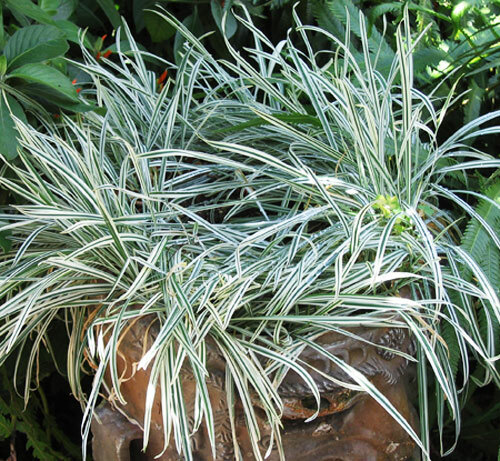 Planting and Care: This is a tropical plant which won't sustain cold weather. Once established it will grow to be about six feet tall and about that wide as well. Give it fertile well drained soil and the hot mid day sun. Routine rainfall or watering will ensure it does well, though it is pretty hardy once established. This is one of those creepy plants with furry flowers. My husband loves them, hence I've taken photographs. 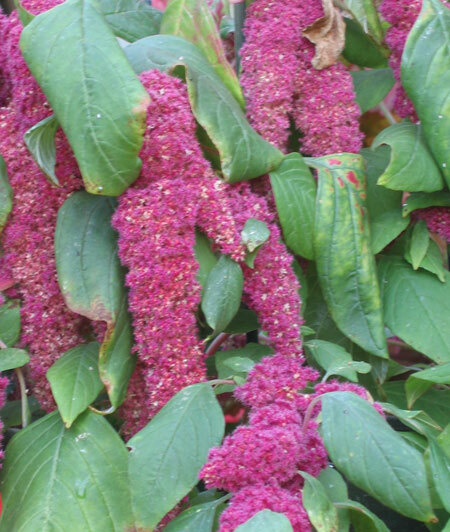 Benefits: All parts of love lies bleeding are considered edible, but I would advise against doing so until you have more information from other sources. It is also said to have medicinal benefits. 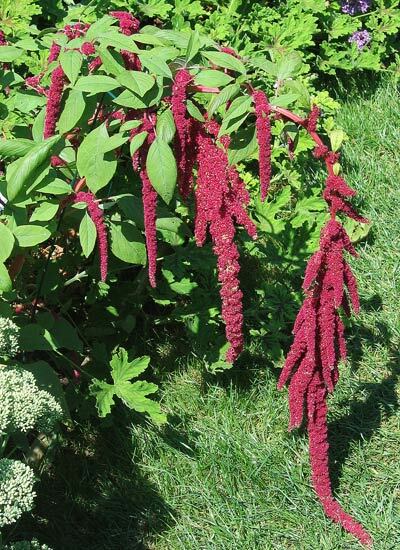 Birds and butterflies like love lies bleeding too. Planting and Care: Full sun is essential to this annual, but will manage both humid or arid situations just fine. It will reach a height of over 4 feet, but is likely to spread much more than that. For the best results plant it in rich loam, though it will do just fine in poor soil. Photographed: In Thuya Gardens on Mt. Desert Island, Maine, in 2013. and on the right in the Winter Garden in Auckland, New Zealand, 2013. 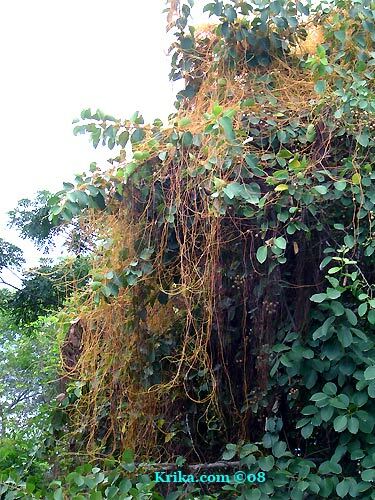 This is a terrible parasitic spaghetti like vine that in no short time will encompass and destroy some of your favorite plants, bushes and trees if you live in a tropical or semi tropical climate. Its color is most commonly a deep mustard yellow, but it may also be seen with a more orange or reddish tinge. Benefits: Cancer patients may be thrilled to know that this plant produces several cancer fighting alkaloids in addition to producing its other health benefits. It is hard to imagine that this very tenacious parasite will ever become extinct so putting up with it will also have its benefits. Eradication: This takes determination and constant vigilance. As soon as you see a bit of the vine, stop and take the time to prune everything that has been twined by its tendrils being very careful not to drop any small piece on the way to the disposal bucket or wheelbarrow. Burn what you remove to ensure that any seeds that may be viable will not take hold anywhere else. From: Hades as the Devil's Twine name implies! Photographed: Just over the fence at a neighbor's home in Montserrat. Planting and Care: YOU HAVE GOT TO BE KIDDING! These traditional perennial garden beauties come in all sorts of luscious colors which serve as a great tall backdrop for other plants in a deep garden bed. They have a peppery aroma which may or may not be appealing to you if they are used as cut flowers, but outdoors the scent is unlikely to trouble you. 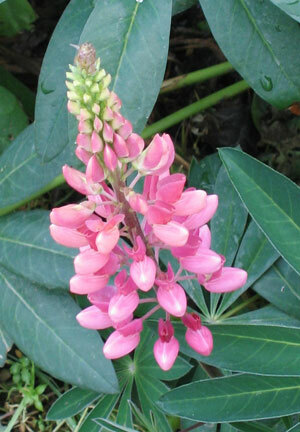 Benefits: Lupin seed pods were a dietary stable for Romans and as well for American Indians. 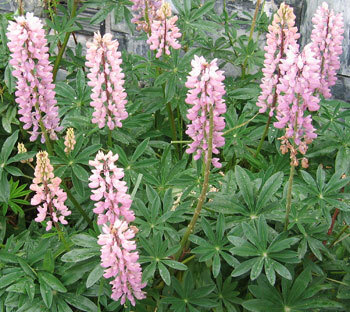 Some varieties of lupin are not edible until specially treated to remove certain chemicals. 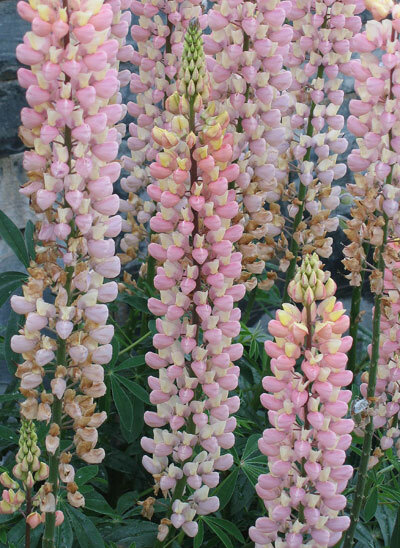 Unfortunately lupins are also related to peanuts and each shares the serious allergic response of the other. From: Such disparate areas of the world as Egypt and the South American Andes. Photographed: In gardens in Ushuaia and Rio Gallegos, Argentina, 2012. 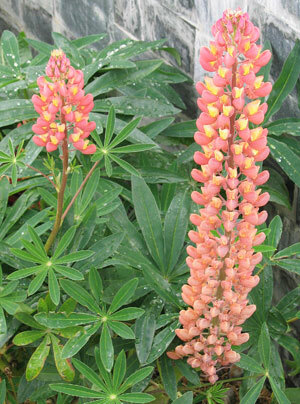 Planting and Care: In cooler climates lupin grow well in full sun and they don't like the heat and moist air of warm climates. Plant them in an acidic soil that drains well. Give them some space, maybe about a foot or so apart and apart from the beautiful flowers, you'll appreciate the foliage as we. 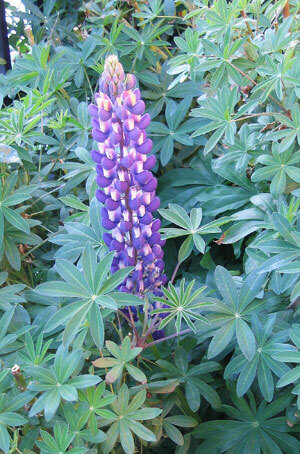 Lupin are nitrogen fixing so they are appreciated by other plants in the garden. Love to travel? Love to shop? Want to work for yourself?